PATTERN LAUNCH: The new Coffee Time Cowl Collection includes 2 different patterns perfect for knitting during your coffee break. The Coffee Time Cowl Collection is inspired by taking moments in the day to create something special either for yourself or someone else. I wanted to design an easy to knit cowl that can dress up any wardrobe. You can use a variety of different yarns to achieve your own style. A nice relaxing design and pattern to knit during your coffee time while you have a moment to spare and enjoy creating something new. 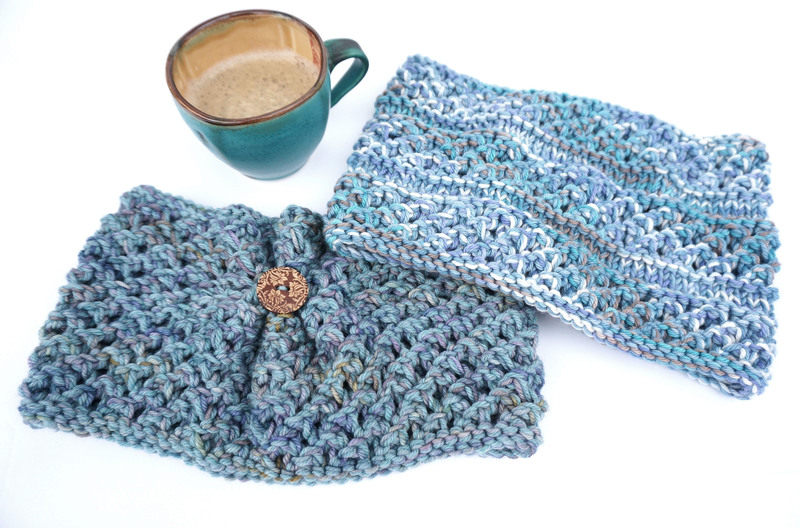 Coffee Time Cowl Collection, includes 2 different styles of cowls. The Layered Look cowl (without button) and the Accordian Cowl (with button). Perfect to accent any wardrobe. Easy to knit in a chunky weight yarn or you can use 2 stranded method with 2 worsted weight yarns for similar results. Each style takes 1 skein of a chunky weight yarn approximately 115 yrds or 105 m, good examples of suitable yarns are mentioned here. Shown in the Malabrigo Mecha and Sweetgeorgia Yarns 2 strands of worsted. Another great yarn I use and sell is the Sweetgeorgia Yarns Superwash six, a chunky weight yarn. My colours in this are Beige, Light Grey and Dark Grey, Message me for more information about the yarn. Great for Spring, Fall and Winter to keep you warm and cozy. This style of scarf is great for when you want a lighter scarf that doesn’t get in the way or over heat you when shopping or going out on the town. Adds a stylish essence to whatever you wear. Very pretty. Love the blue yarns you used. Thanks. Sweetgeorgia makes beautiful yarns.